Our creative connections add dimension and positivity to our school year. We proudly partner with our community, our school parents, and our students to bring outstanding advantages and experiences to Panther Nation. These interactive opportunities mutually benefit us all and spread Panther Pride throughout our school, our hearts, and our community! This unique program draws on the generosity of generations! 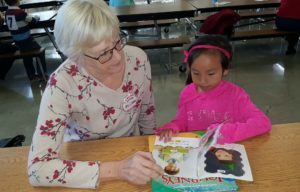 Volunteers including retired Paris School educators, Paris School grandparents, and Paris School supporters gather one afternoon a week for one-on-one read aloud sessions with our students. Our kids enjoy this special connection and unknowingly improve their reading skills in the process! Paris School 5th graders participate in this proven programming that seeks to prevent use of controlled substances, membership in gangs, and violent behavior. Deputy Friendly of the Kenosha County Sheriff’s Department leads ten weekly classroom sessions that teach self-awareness, responsible decision-making, strategies for resisting peer pressure, and ways to handle responsibilities and challenges. Deputy Friendly also joins us for a special D.A.R.E. graduation ceremony and reception for students and families upon program completion. This program encourages students and staff to connect with a book of their choice for independent reading-for-pleasure. Just 20 minutes of daily dedicated reading helps our K-5 students increase word recognition, vocabulary, and comprehension. Our teachers also participate, modeling the value of reading and often making book recommendations for our young literary enthusiasts! Our unique mentoring program pairs each K-4 student with a 5-8 grade partner for joint learning experiences including journaling activities, writing and art projects, school assembly presentations, and community service initiatives. We find that kids working together in these ways builds tolerance, leadership, and school unity. From preparing and assembling our themed upper hallway during our annual Literacy Unit to fully participating in their 8th grade fundraiser activities to planning their graduation banquet and ceremony, we give Paris School eighth graders the autonomy to work cooperatively on special projects throughout their final Paris School year. Through these activities, our young people gain added confidence in their strengths and skills and take ownership in making their last year at Paris School the best it can be! Our signature token economy systems reward students for academic efforts and exemplary citizenship. When we notice and recognize positive behaviors, they continue! Students in grades K-5 receive PAWS to reinforce the tenets of our Panther Pride code of conduct. Elementary school earners are granted time each month to “spend” their PAWS at the Paris School Organization’s PAWS Store. Our middle school scholars earn Panther Bucks that may be used to purchase school supplies, snacks, or special opportunities such as sitting by a friend in class or freedom from one homework assignment.